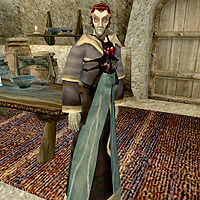 Salver Lleran is a Dunmer sorcerer who sells spells and spellmaking services to fellow members of House Telvanni of rank Oathman or higher from his shop in the southern corridor of the Telvanni Waistworks in Vivec. If you are a member of the House and have been expelled, you can speak to him to make amends and be allowed back in. Salver wears an extravagant robe along with a pair of expensive shoes. He carries an ebony shortsword along with up to 15 gold. Aside from his natural resistance to fire and the sanctuary provided by his ancestors, he knows a wide variety of spells. Specifically, these are the spells that he will sell to you.